Temporal Synapse is a series of six hospital feature walls providing visitors with a pleasant distraction, while encouraging interaction with the art and others. It may spark a conversation between strangers, or redirect a patient’s focus. Lighting smoothly follows visitors within the space, revealing a pattern system in the wall resembling synapses in the brain. The entire network of walls moving vertically through the building represents the nervous system at its core. This project was commissioned by Eskenazi Health, consisting of six elevator lobby feature walls in the Outpatient Care Center. In the body, a synapse allows electrical and chemical signals to pass between cells. The synapse permits the stream of data and information to flow through our nervous system. Temporal Synapse takes this anatomical concept and recognizes the linkage between our body and continually developing technology. As communication and networking is ever increasing, the need for temporality and reality within our surroundings becomes more relevant. This relationship is graphically rendered in a physical space that can be experienced by visitors of the hospital. 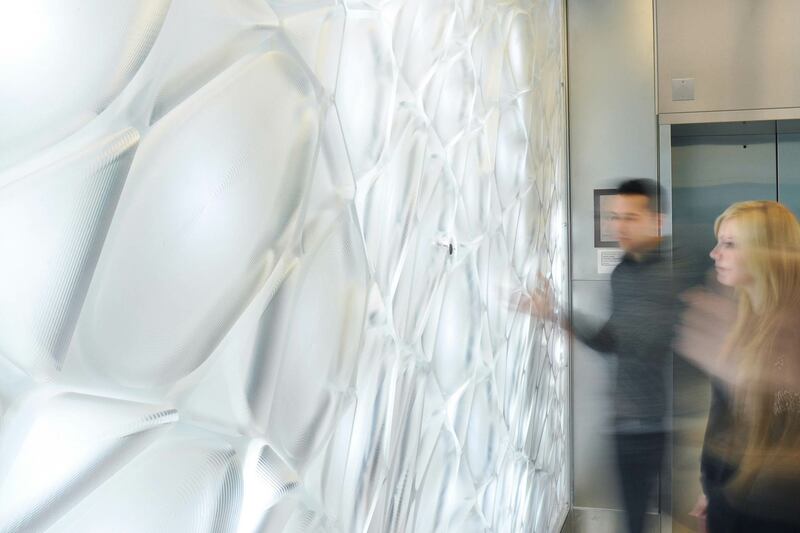 Each wall is transformed into an intriguing reactive lighting element that visually connects users to the human body and their environment. Through the flow of light within this system, data about the space and its users is visually perceived. 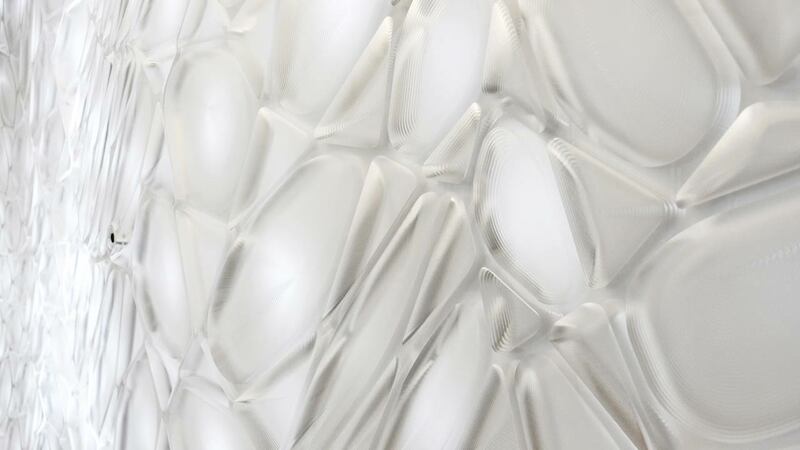 The graphic patterning of the wall is developed from cellular structures seen within the body. The gestural continuation of this pattern can be read through each floor, growing throughout the elevator lobby tower. Each elevator lobby is developed from the same system, but form and scale of the pattern change, creating variation on each floor. An elevator lobby by definition is a temporarily inhabited environment. In a hospital, this common and often mundane experience of waiting can lead to adverse thoughts and emotions. In contrast, Temporal Synapse aims at providing the visitor with a pleasant distraction, encouraging interaction with the art and other visitors. It may spark a conversation between two strangers, or redirect a patient’s focus, even if temporarily. It can be both soothing and ambient, or lively and playful. The elevator lobby becomes a source of energy and life throughout the building, redefining what it means to wait. 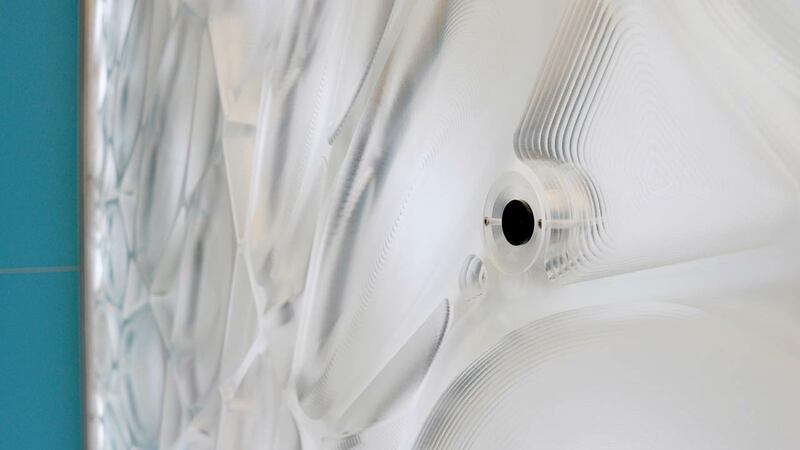 The shell is milled out of custom cast 1.25” clear cast acrylic with a 1/8” white acrylic light diffuser in order to obtain a very specific appearance and translucent quality. 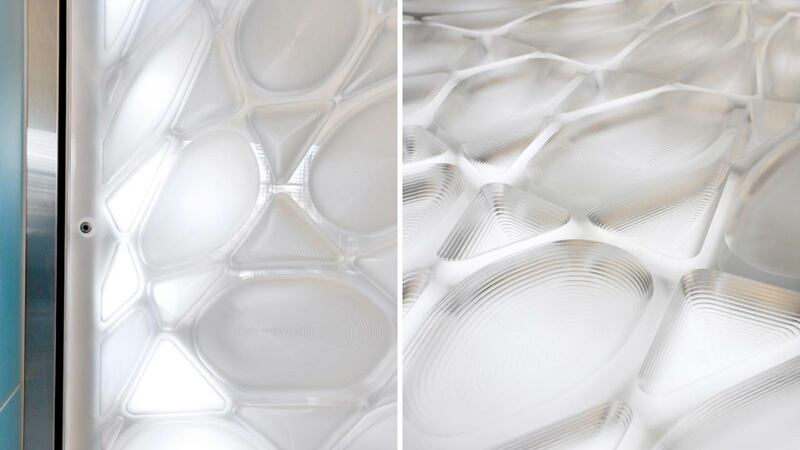 The form milled into each component exaggerates the depth of the pattern and accentuates the lighting quality of the material. These removable shell panels are applied over a pre-fabricated network of electronics, embedded in aluminum reflectors. This layer acts as a container for each LED, restricting light from bleeding laterally beyond each cell. The acrylic, aluminum webbing, and all electronics are mounted to a welded aluminum frame that is fastened to the core of the building. The hardware and software system was developed by our former colleague, Eric Brockmeyer. Custom drivers power the high output LEDs and a computer vision system interprets user movement in the lobby. We worked with Eric to develop the interaction scenarios and fading patterns. 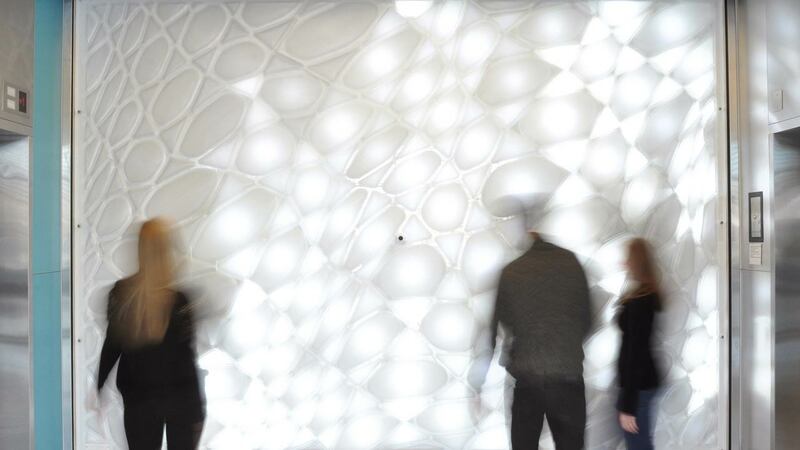 As the wall is engaged, a smooth pulse of light spreads to the surrounding components, and the compounding effect traces user movements in the space. These temporary reactions continually update, creating unique experiences.